This is the second photograph sent to us by Neil Thorp; the first one is in Snapshot 139. 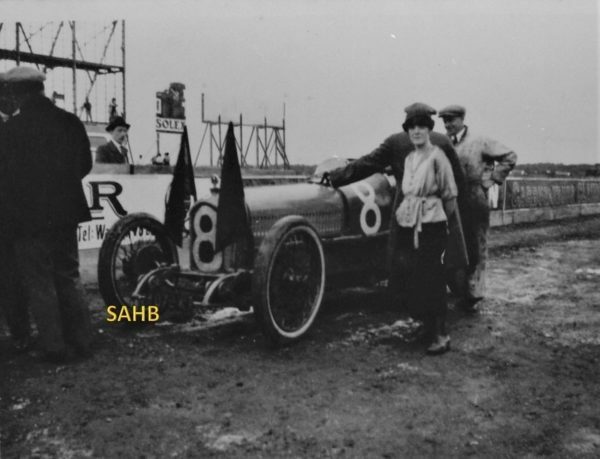 We managed to identify the car in this second picture as a 1921 3-litre straight-eight Ballot racing car – one of only four built. The same Team DAN website we used last week told us that this car raced at Le Mans in the XV Grand Prix de l’A.C.F. on 26th July 1921, driven by Jean Chassagne, and retired on lap 17 with a ruptured fuel tank. The same mystery lady appears in both pictures – one seemingly on 26th July, and one definitely on 17th September, with the EHP team. But… we reckoned that no self-respecting stylish Frenchwoman of 1921 would wear the same outfit in July and September, especially at the same venue – so both pictures must be from 17th September. We therefore think that the Ballot came back to Le Mans in September to act as a steward’s or pace car for the cyclecar race. The two flags at the front of the car seem to support this idea – as, possibly, does the number plate hung on the front cross-tube. And who is the smiling driver in the grubby racing overalls? From comparison with other pictures, we are convinced that it is indeed Jean Chassagne. The 8-cylinder twin-overhead-camshaft Ballot racing cars were among the most advanced designs of the early 1920s – developed with the help of the brilliant engineer Ernest Henry. Between them, the four cars raced at the 1920 and 1921 Indianapolis 500, the 1921 French GP at Le Mans, and the 1921 Italian GP (in Brescia). When the International Formula changed to 2-litre cars in 1922, these four cars were sold off. This car, No. 8 driven by Jean Chassagne, was bought in 1923 by Sir Malcolm Campbell. He had it painted saxe blue and named it “Blue Bird”, and raced it in many Brooklands events. At some time, the car was in the hands of Jack Dunfee, Cecil Clutton and, for 70 years, the Milling family. For the first time since 1921, this Ballot and one from the Musée National de l’Automobile at Mulhouse were reunited at Rétromobile in 2017. Jean Chassagne’s long racing career started in 1906 with Darracq and ended with Bentley in 1930 at the age of 49; in recognition of his association with Bentley Motors, Chassagne Square in Crewe was named in his honour. But we still cannot identify the mystery lady. Can somebody enlighten us? He married an Emma in 1921, half English, half French and remained married until his death in 1947.Perhaps that is the mystery lady. I am the owner of this car! Very interesting storry, because the Ballot was winning the first Grand Prix from Italy on 4.September 1921. I will be very happy to get in contact with Neil Thorp. My friend Alexander Schaufler send methis photo where we can see my grandfather Ernest Henry with the hat on the left and ,surprise I think the woman is my grandmother Marie . I have found a photo to her and for me thers is no doub .